Brady #4535 - Yankee Golden Retriever Rescue, Inc.
Brady was 1 ½ years old when he was surrendered to YGRR because he was too exuberant for his family. His owners were physically unable to handle him and described him as an overgrown puppy. 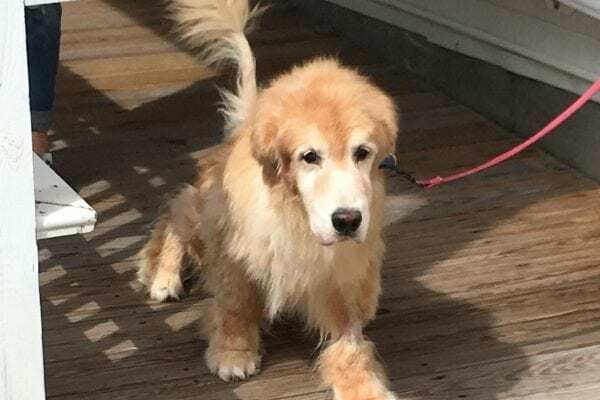 They recognized that they were unable to meet Brady’s needs and they made the decision to let YGRR find him a new home where he would get the exercise and training he needed. Brady was a healthy boy and he was soon getting used to the routine at Riverview. He really did have many of the same habits as a young puppy, just as his owners had said. He would get into the trash, he could be mouthy when he was playing, he jumped on people, and he pulled when walking on leash. He needed positive reinforcement and consistency, and Brady did very well with some guidance. He loved to play with toys, though he would try to remove the squeakers. He loved to spend time in the play yards or the home simulation room. When getting attention from people, Brady did not seem to realize his own size, and one of his favorite places to sit was in your lap! We knew this special boy needed a home where his family would continue to help Brady become a model citizen. 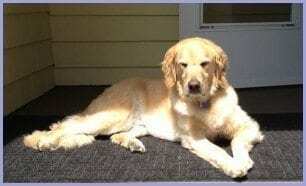 Brady now has a wonderful home with experienced Golden owners. He is a big part of his adoptive family and they are very committed to him. They patiently worked with him on his manners and training, and it has all been worth it to have such a friendly and wonderful boy. Brady gets regular exercise and consistency, and he has blossomed into a well-behaved Golden boy who loves to meet other people and play with other dogs. He also loves to vacation on the lake with his adoring owners! Brady has the home he needed, and his new family looks forward to many years of happiness with their special boy! Brady thanks you for your support. Brady received the consistent handling and exercise he needed at Riverview so we could start preparing him for his new home. We recognized that he was a fun-loving, sweet dog who needed patience and lots of positive reinforcement for his good behavior. We are able to give each dog the attention they need and place them in the right new home thanks to your generosity. Brady and all the Rescue dogs thank you and send big wags and kisses your way.